Boot slippers in adult sizes, knit with double yarn. 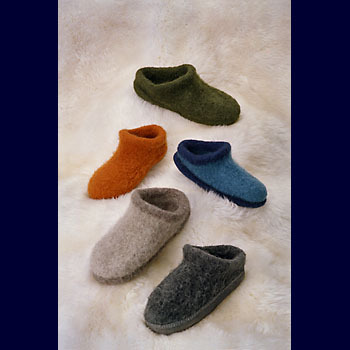 Designed to be felted to a very thick, firm fabric, these boot slippers will keep feet warm and cozy. High top version is great for after ski wear while the low top version makes a good everyday slipper. They feature double soles for extra comfort and longer wear. These slippers are made using a double strand worsted weight yarn. Pattern provides sizing for Womens and Mens shoe sizes.